I will be the featured reader at The North Jersey Literary Series reading at Classic Quiche Cafe in Teaneck NJ, on Saturday, July 24. The reading, a monthly event, takes place in a special events/performance space off of the main restaurant. It begins at 8 pm. 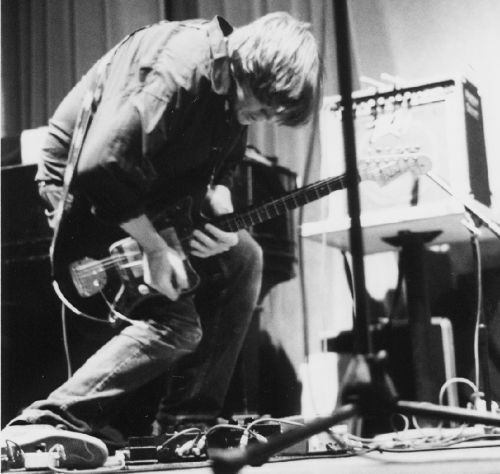 My presentation will likely include Cantos Seven and Eight from Huncke, the former recreating a completely imagined performance by Thurston Moore (above), an actual reader at the real Herbert Huncke memorial. His topic is Beat Poetry. And New Jersey. And New York City. Canto Eight?—mostly about cartoons. Please come, if you can. There is an open mic, and the event, hosted by Denise LaNeve and Paul Nash, is a highlight of the monthly poetry calendar in North Jersey. Classic Quiche Cafe has a tremendous menu, and I really like the room. This entry was posted on July 20, 2010 at 3:43 am and is filed under Readings. You can follow any responses to this entry through the RSS 2.0 feed. You can leave a response, or trackback from your own site.